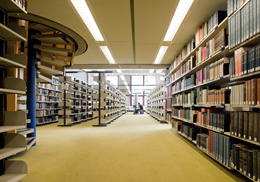 The University Library of Bochum has a two-tier library system consisting of the University Library and more than 50 specialist independent departmental libraries. The library collects bibliographies, reference works, basic research literature, academic textbooks and periodicals from all subject areas and lends out nearly all its stock, whereas books and periodicals in the departmental libraries are for reference use only. It contains about 2,015,000 volumes and subscribes to around 2,000 periodicals. A wide range of CD-ROM databases, available to users via the university network, more than 30,000 electronic periodicals and a number of electronic publications and dissertations are also provided. The library has more than 60 networked computer workstations offering good working conditions for all users. The library is located on the main campus.